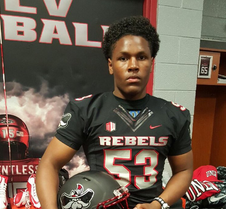 UNLV picked up a commitment from one of top defensive starters on Bishop Gorman’s 2016 national championship squad when middle linebacker Farrell Hester pledged the Rebels on Tuesday. The 6-foot, 235-pound Hester led the Gaels in tackles with 97 and also had four sacks, 10 tackles for loss and two interceptions. Hester announced his decision on Twitter. Hester is the third Las Vegas prep product in the Class of 2017 to commit to Tony Sanchez’s squad joining the explosive Desert Pines duo of quarterback Marckell Grayson and running back Isaiah Morris.